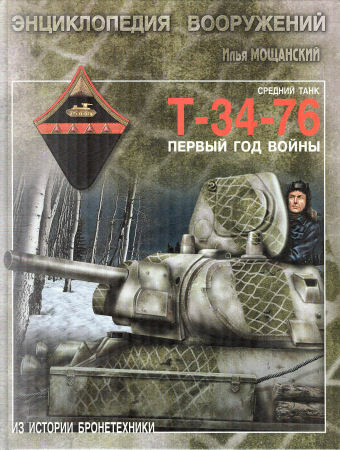 Just as many new books on German armor seem to keep appearing, the Russians are cranking out books on the T-34 and other WWII (Great Patriotic War) tanks. Some are by what could be termed “hack” writers, but occasionally a “new” face appears in the crowd. Il’ya Moshchanskiy is an armor enthusiast and historian as well as a talented draftsman. He has written for several Russian modeling magazines such as M-Khobbi and Tekhnika i Vooruzheniye and has pulled off some coups, such as being able to shoot six rolls of film of the first prototype BTR-90 Vostok before even the Minister of Defense, Pavel Grachev, had seen the vehicle. Il’ya has now written a book focused on the T-34 Model 1941 tank as it entered into combat and began to evolve for speedier production. The book’s text covers production of the T-34 in 1941 to include the new factories picking up production and the transfer from Kharkov to Nizhniy Tagil in October 1941. He covers many of the items of interest such as the short-lived T-34-57 with the ZIS-4 modification of the ZIS-2 antitank gun, applique armor suites, and what each factory’s details looked like – Factory No. 183, Factory No. 112 (“Krasnoye Sormovo”) and Factory No. 221 (Stalingrad Tractor Factory). Among other items covered are tow hooks, wheels, tracks, turrets, and fittings. While the hulls were pretty much the same for most of this period, the fittings all changed and each one also had its own idiosyncrasies of how it followed the guidelines. Some tanks are shown with as many as 10 34.5 liter external fuel tanks as apparent factory fittings. Admittedly readers can get more out of the book if they read Russian, but even so it’s pretty easy to figure out what “T-34 yada yada 1941 yada yada 183"means. Overall this is a good book for T-34 fans and compliments others such as the “T-34 Top to Bottom” series.